A Dutch Catholic mystic and saint whose relics were kept in Brussels for over two hundred years. 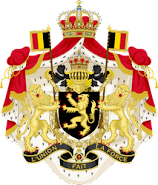 One of the sisters of Princess Lilian of Belgium, Ludvine Baels, appears to have been named after her. 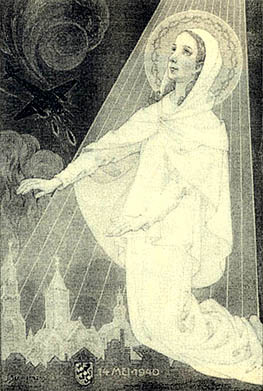 Below is an image of the saint protecting a church during the German bombing of Rotterdam on May 14, 1940. 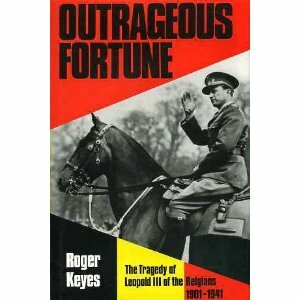 A British radio interview with the younger Lord Roger Keyes in defense of King Leopold III. Highly recommended. Many thanks to Daniel Wybo for bringing this to my attention. Via RTBF, Florence de Moreau de Villegas de Saint Pierre, chatelaine of Louvignies, gives several brief presentations on the life and work of her aunt, Maria de Villegas, Countess van den Steen de Jehay, a close friend and confidante of Queen Elisabeth of Belgium. The presentations are all in French, but can be roughly followed in other languages through the automatically translated subtitles. For anyone wondering about the origin of the family name, the De Villegas are Belgian nobility of Spanish ancestry. Maria was an intellectual and literary figure, and a heroine of World War I. She worked devotedly with Queen Elisabeth in nursing wounded soldiers of all nationalities, and in providing relief and comfort for Belgian civilian war victims. The programs feature her letters, diaries, glimpses of her wardrobe and a tour of Louvignies itself. One particularly touching excerpt from her writing, noted in the clip above, is as follows. After the death of King Albert I, the Countess wrote to Queen Elisabeth to express her condolences: "I weep with you, Madame, for the admirable man you weep for. I weep for your happiness. I loved you so much when you were happy. Let me love you even more when you are unhappy." More on Elisabeth's war work and her friendship with the Countess can be read HERE. Florence de Moreau's book on Maria de Villegas is available HERE. 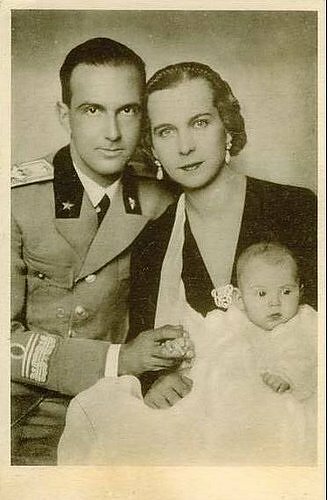 In response to questions, I wanted to share some thoughts on the troubled marriage of King Umberto II of Italy and Queen Maria José, daughter of King Albert I and Queen Elisabeth of Belgium. For a more in-depth account, I can recommend this article by Cristina Siccardi, as well as the biographies of Umberto and Maria José by Luciano Regolo. As a young bride, Maria José suffered from many nasty rumors. Evil tongues mocked her thick, curly hair by calling her la Négresse blonde, whispered that her children were not Umberto's, or suggested that they had been conceived artificially, since the princess had been unable to become pregnant for four years... The rumors were unsubstantiated, although Maria José loved to form friendships with artists and intellectuals and her bold, unconventional ways, like those of her Wittelsbach mother, probably fostered gossip. It is also probably true that Maria José and her husband were basically incompatible. The marriage had been arranged by the Belgian and Italian royal families to strengthen the friendship between their countries dating from the First World War. The Treaty of Versailles also left very few Catholic reigning houses to provide suitors for Maria José. From childhood, she was raised by her mother to see Umberto as the perfect Prince Charming, arousing expectations of a great love which were later sadly disappointed. Umberto and Maria José had admiration, respect and affection for one another, but Umberto seems to have had trouble relating to his wife in a romantic way. My impression is that he loved her, but was not in love with her. Umberto was concerned and solicitous for his wife, but tended to be reserved and distant towards her. After the fall of the Italian monarchy and the exile of the Savoys, Maria José found Portugal, the royal family's refuge, too depressing. She also had difficulty relating to her husband on a daily basis. While Maria José was much more open, Umberto tended to hide his feelings of deep sorrow and humiliation, to withdraw into silence. His wife came to believe that he needed space to deal with his inner turmoil. Accordingly, she moved to Switzerland, where she felt more cheerful. Health reasons also contributed to her decision. The royal couple, however, always maintained cordial relations, and continued to visit one another. Umberto, who shared Maria José's cultural interests, assisted his wife with her prestigious historical research on the House of Savoy, and wrote her beautiful letters. Every month, he sent her a bouquet of red roses with an affectionate note. When Umberto was dying of cancer, his wife was at his side and they spent many tender hours together, holding hands. There have been many allegations that Umberto was unfaithful, and even bisexual, but some skepticism may be in order, as many of these claims seem to have been fomented by the fascists, who saw the handsome, popular young prince as a potential threat to Mussolini. It is also known that Umberto was deeply religious and Maria José praised him in the highest terms, after his death, as a man of great moral rectitude and personal virtue who never lost his dignity or rigor, even amidst the most atrocious sufferings. In the end, I feel that the King and Queen had a good marriage. It is difficult for anyone who had even the slightest experience of the field hospitals in the early days of the War to think or write calmly of the scenes they witnessed. 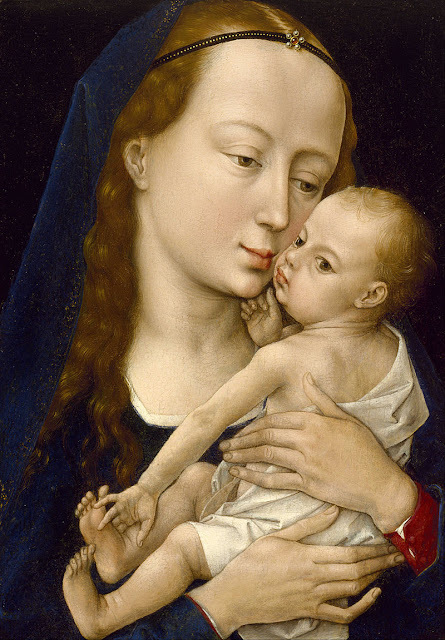 Yet the Queen, who was not of robust physique and has that sympathetic temperament which makes it difficult to witness suffering, shrank from nothing. There was hardly a field hospital in the whole of Belgium that she did not visit at some time or other during the War. She not only visited them, but took part in the actual nursing, often assisting in the dressings and in the work of the wards. Her Majesty did a great deal of her nursing under Doctor Depage, who had helped her in her training. Her previous experience, when assisting her father, Duke Charles Theodor, stood her in good stead. 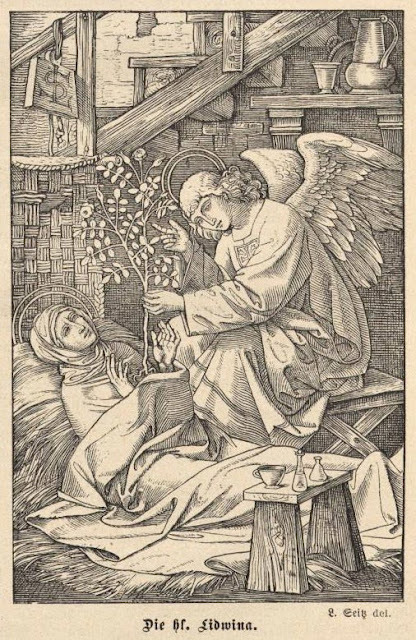 From her girlhood she had been used to sick beds and the consolation of suffering, so now she passed through ward after ward, bringing cheer and comfort in her train. As the field hospitals travelled from place to place where they were most needed, the Queen did her utmost, and inspired others to do their utmost, too, to find suitable buildings in which they could carry on their magnificent work. She was intensely anxious that there should be full equipment for both the wounded and the staff. Often bedding was impossible to procure in sufficient quantity, and the wounded slept on straw. Her Majesty organized house-to-house collections for bedding, and, when the hospital was at Furnes, she gave twenty beds with spring mattresses for the use of the most serious cases. Once when it had proved exceptionally difficult to get supplies, the Queen, attended by only one lady-in-waiting, went from house to house to see what could be obtained. The inhabitants of the place were for the most part more than willing to give, but the exigencies of war had left them with little. Few recognized the slender, gentle-voiced lady, who pleaded for the wounded soldiers, as their Queen. One good woman, who had given all but the bed on which she herself slept, was so overcome when she learned of her visitor's identity, that she hurried after her up the street, dragging her one mattress behind her as a final offering ! The Queen visited the hospital at Furnes twice regularly every week, and her visits were made without ceremony of any kind. She was never accompanied by more than one lady and, as a rule, by a Belgian medical officer. Her interest in the patients was felt and appreciated by everyone in the hospital. Her thorough knowledge of surgery and medicine made her able to understand and appreciate the methods of nursing, and she never failed to pay due tribute to the staff for their efforts and for the extraordinary ingenuity with which they carried out serious operations with wholly inadequate materials. In one hospital in four days there were admitted nearly four hundred patients, many of them with wounds necessitating grave operations, yet all the surgeons had to work with were two scalpels, a finger saw, and a few forceps ! From bed to bed the Queen would pass, a slight figure always plainly clad, usually in black, with a word for each of the men who had suffered in her country's cause. To each she spoke — to Belgians, French, and Germans (for there were usually a few Germans brought in with the rest), as Her Majesty made no distinction. 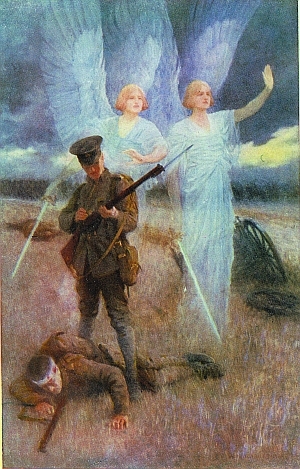 They were suffering ; they had made the supreme sacrifice for what each believed to be the right, and in that place of pain at least there was no room for bitterness. In the early days of the War, the Queen expressed a hope that Belgian women who could write both English and German would force themselves to forget their wrongs, and, for the sake of humanity, attend hospitals to write letters for prisoners other than Belgians. She realized how the anxiety of many a soldier's home would be alleviated if news, however slight, reached their homes. In the Queen's mind, as in the minds of her noble fellow- workers in the cause of the Red Cross, a wounded man had no nationality ; he suffered, and that was enough to evoke all that was humanly possible to ease his pain, both mental and physical. Sometimes the King accompanied the Queen on her visits of mercy — always in his soldier's uniform without decorations of any kind. Together they would go round the hospitals, not so much as a King and Queen visiting their subjects, but as a kindly, simple man and woman, eager to do what they could for their fellow-creatures. Her Majesty was deeply interested in the visits which Madame Curie, the world-famed scientist, paid to the hospital at Furnes, where she stayed to work for a week, bringing her X-ray equipment for the use of the hospital. To aid Madame Curie in her much-valued labours on behalf of the wounded, there was fitted up for her a radiographic department with the aid of thick curtains and much brown paper. Here this remarkable woman worked with untiring zeal, taking radiographs of innumerable cases. Her daughter was assiduous in helping to develop the plates, and thus enabled Madame Curie to achieve work of the utmost value. At a later stage in the War, the Queen took a deep interest in the marvels of plastic surgery, which enabled so many poor fellows to take up their work in the world after leaving the hospital. At one hospital some very severe facial cases were being treated, and the head surgeon, anxious to spare the Queen some terrible sights, begged her not to visit that particular ward. Her Majesty was not, however, to be deterred by the awful disfigurements. "They suffered for their country," she remarked, "and the Queen of that country should be the last to shrink from them." She spoke to each man in turn, pressing his hand in kindly sympathy before she turned away. Passing month by month from hospital to hospital. Her Majesty constantly encountered those pitiful screams of homeless refugees who, with houses shelled and villages laid waste, straggled to the frontier. 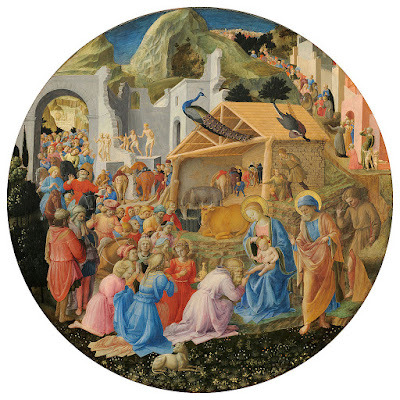 They would be met carrying their few poor possessions on their backs, or pushing wearily their hand-carts before them. Little children, hardly old enough to realize the horror which had befallen them, might be seen pushing perambulators filled to overflowing with what could be gathered up of the few remaining household possessions. Old men staggering under sack-loads of clothing and bedding and women burdened with the strangest assortment of miscellaneous goods, were fleeing from misery into darkness. The Queen saw them all, and with tears in her eyes would stop to speak to them as they passed. They could not tell her where they were going, for to half of them their destination was unknown. They only knew that their homes had been destroyed by the enemy and that now they must seek an unknown country and an unknown future. These processions distressed the Queen even more than the scenes at the hospital, for there at least all that was possible was being done. For these poor refugees there was nothing Her Majesty could do except to give a child a caress or slip some silver coins into a woman's hand. Her Majesty sought no recognition and, in her war work, was content to be taken for an ordinary member of the Red Cross. But to the refugees she would sometimes reveal her identity if she thought that by so doing she could give some slight comfort or even shadow of encouragement to the poor creatures. "I will think of you, I will pray for you daily," she would tell them, as they trudged on their desolate road.